The British artist Peter Kennard was among a dozen artists who turned up to reclaim their work from the Design Museum this morning (2 August) after the London institution hosted a private arms trade event on 17 July. They were part of a group of 40 artists and activists who had called for their work to be removed from the political exhibition, Hope to Nope: Graphics and Politics 2008-18 (until 12 August), or elsewhere from the museum. In a statement they said it was “deeply hypocritical for the museum to display and celebrate the work of radical anti-corporate artists and activists, while quietly supporting and profiting from one of the most destructive and deadly industries in the world.” More than 40 works, or one third of the the show, have now been removed. 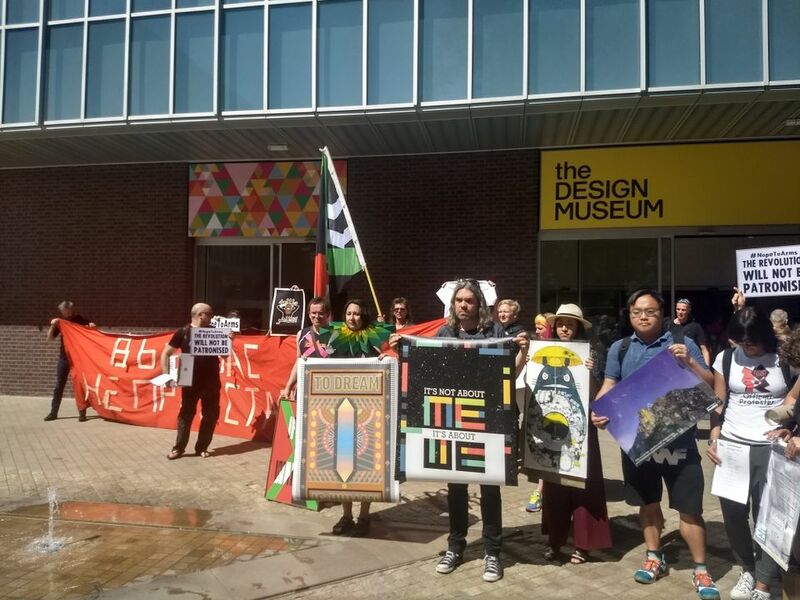 Kennard, whose silkscreen print, Union Mask, was removed from the permanent collection display at his request, says he was “appalled” by the response to the protest from Deyan Sudjic and Alice Black, the directors of the museum. The @DesignMuseum put on an exhibition of radical protest art. Then they hosted an event for an arms company. That's why over forty artists in the show have demanded that their artwork is taken down. Campaigners say they were not aware the event, organised by the Italian aerospace company Leonardo to coincide with the Farnborough International airshow, was taking place. Kennard says the museum’s double standards were laid bare when it was revealed that another politically engaged panel, Corbynmania: Social Media and Jeremy Corbyn, was happening next door the same evening. Kennard, who protested in 2012 against Finmeccanica—as the company Leonardo was then known—and its sponsorship of London’s National Gallery, says he removed his work “in solidarity” with the artists in the Hope to Nope exhibition. “They gave all their work for free for a paying exhibition,” he says. Other artists who removed their work from the museum today include This Ain’t Rock’n’Roll, the Space Hijackers, Occupy Design Collective, Bristol Streetwear and BP or not BP. They were accompanied by activists from Syria, Hong Kong and Bahrain who they say “have been repressed using UK-manufactured weapons”. Although not present, the Los Angeles street artist Shepard Fairey was among 40 artists to have signed a letter calling for their work to be removed from the exhibition, which explores how graphic design has shaped politics, starting with Fairey’s famous 2008 “Hope” poster of Barack Obama.